A bicyclist received life-threatening injuries after being struck by a motorist in the Fairfax Station area. See the Patch article Bicyclist Struck by Car Sunday. The bicyclist was riding north on the trail parallel to Route 123/Ox Road. According to one eyewitness who commented on the Patch article, as the cyclist was crossing South Run Oaks Dr, a motorist "was speeding in the left lane and, without signaling or braking, recklessly crossed over the right lane and into the bicyclist." Another eyewitness stated that "The bicyclist could not even anticipate being horrifically struck and thrown from his bike, as the SUV made an unpredicted and dangerous right turn, without signaling or braking, from the left northbound lane." The bicyclist was taken to the hospital. No one has been charged in the crash. We're very concerned by the statement from police spokesman Don Gotthardt who said "The bicyclist didn't stop and the driver didn't see him," basically blaming the bicyclist and relieving the motorist of any fault. We assume the comment from the police was made after the eyewitnesses made their statements. According to the article, "No one has been charged in the collision, police said." From the image it does not appear that there are stop signs on the trail. Even if there were, they would likely not be enforceable. There are white stripes that often indicate a stop bar on a road; not sure what they mean on this trail. Regardless, if the motorist was driving recklessly, there should be some accountability. However, Virginia is a contributory negligence state, one of only 4 such states which include Maryland, DC, and North Carolina. Not only are stop signs on either side of the trail present, there is a STOP Bar, as you have indicated. Additionally, there is the word, STOP, right at the stop bar, and again in 30" letters, 30 feet before the STOP sign / bar. THIS INTERSECTION IS VERY WELL MARKED. But back to this incident: I am not buying the statement about the SUV "not braking" or speeding. I drive an SUV and have to brake to about 20 -25 mph to make this turn. Also, there are no skid marks from a vehicle supposedly skidding or sliding. The Kia SUV would have left them, if it were really driving reckless. Sorry about the cycler, but they should stop, look both ways, then proceed when safe. This is what I was taught as a child and have passed on to my kids. 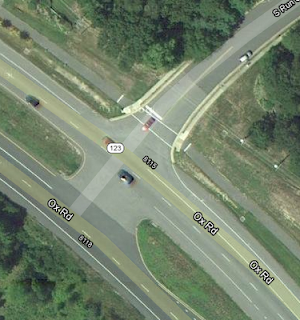 Maybe Fairfax County should take the initiative and swap SLOW signs for STOP signs at trail intersections. There is a recurring problem with the stop signs at trail intersections with roadways. They are placed too prominently and are confusing at least some car drivers into thinking that the drivers have right of way. The stop signs are also causing additional hate from drivers when bicyclists roll through them, as a look at many comments on other sites will confirm. That is going to be the case, whether or not any but the most dedicated has read into the arcane legal questions behind those stop signs. The stop signs do not, as far as I know, overthrow the standard Virginia mandated right of way for pedestrians at crosswalks (§ 46.2-924. as well as multiple legal opinions.) A trail stop sign may have also stopped the police from properly ticketing the bad driver in this case. It is disturbing that no ticket was issued to the driver. Maybe the officer thought he would have to give a ticket to the driver (from the discussion it possibly could include Reckless driving; general rule, 46.2-852; Failing to give proper signals, 46.2-860; and Drivers to stop for pedestrians, 46.2-924) and a ticket to the bicyclist (from the discussion, maybe, failure to stop at a trail stop sign, unknown code). Since Virginia’s contributory negligence framework would bar recovery for the bicyclist if he were even partly at fault, this would have been a double insult, and the whole issue may be better left to the civil courts without extra tickets. If the purpose of the trail-facing stop signs is to slow down bicyclists and not to confuse the right-of-way question, then they should probably be replaced with SLOW signs. Maybe it would be worth raising in the Fairfax County Master Bike Plan as a policy recommendation: remove STOP signs from trails and replace them with SLOW signs. So the state, through VDOT, took time to install STOP signs, and one would like to challenge their meaning? YGBSM! STOP means STOP. Pretty clear to me. The reports point to the cyclist ignoring the STOP sign, and all other warnings at the intersection.